The purchase of a Bedgear Dri-Tech 5.1 Mattress Pad and two advance-performance pillows is required for your 18-Month Love your Mattress Guarantee. In order to exchange the mattress must not be soiled, stained or ripped. 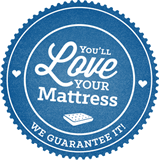 Limit one Love Your Mattress Guarantee exchange per original purchaser. *This offer is extended to the original purchaser only. Your new mattress will take time to adjust to your body. You must sleep on your new mattress for a minimum of 30 nights before a mattress exchange can take place. Exchanges are for same size mattress only and do not apply to pillows or protectors. Foundations and power bases not included in exchange. Customer is responsible for all transportation costs.